Annual election meeting for new officers will be held again May 8th, 2019; annual selection of Post leadership will be conducted. This is one of the most critical meetings of the year. We need to elect our leadership for the next 12 months. Installation of these newly elected officers will occur at the Wednesday, June 12th, 2019 monthly meeting. I you can only make one meeting in the year, this is the one. Please come and show yoursupport for and honor those who have volunteered to assume the responsibility of guiding our Post 501 for the next year. 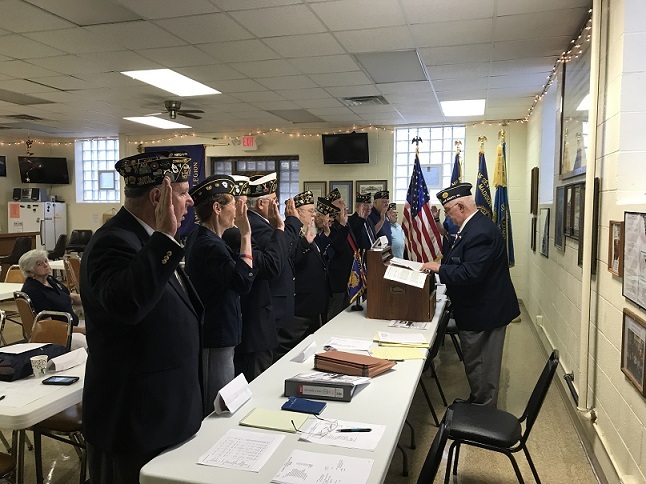 The Legionnaires who occupy leadership positions at Post 501 are the heartbeat of keeping the goals of our American Leadership moving forward. Their responsibility for their offices is critically important to insuring that the needs of the veterans, their families and for all youth are kept foremost in mind. They also are responsible for the daily operation of Post 501. Leadership requires a bit of dedication, and effort beyond the normal call of everyday membership. Positions are either elective, or nominative, and installed on an annual basis. Young Legionnaires are encouraged to apply, and work their way into higher positions, as their time allows. Executive Committee: Don Brinkmeier 2 yrs. At Post 501's member meeting last June 14, 2017, Cdr. Stolarczyk called the incoming officers to the front of the Hall. Cdr. Stolarczyk introduced the installing Officer, Cdr. Gary Dobson of Post 279. Cdr. Dobson then began the installation by reading the requirements of the various positions. He then led in the Oath of Office for the officers of the coming year. This was followed by the informing of each officers of the duties of their position. The Installing Officer then introduced the newly installed officers to the Post. Post 501 will have this same procedure implemented this next election. Only the names of the Leadership will change. Elections are held in May of each year. Post 501 membership needs for each of you to step up, at least for one year.